Dietary life of the Japanese people has changed enormously over the past 50 post-war years. The protein/fat/carbohydrate (PFC) calorie supply ratio in Japan, as of 1995, is 13.6:29.5:56.9 (FNRA, 1997). This is a rather desirable figure compared to those of Western countries. The new energy crisis: food, feed, or fuel? Can anything be more exciting, or more challenging, in our industry today than the competition for grains? Should food, feed, or fuel get first priority? In a global feed industry of some 700 million tons of manufactured feed, where often 55% of the total cost is energy ingredients, any minor change in grain prices has a major impact on cost. A bushel of corn (~25 kilos) was available at US$2 in 1980 when I started Alltech, and was still $2/bushel in early 2006 when prices started to rise. Now it is more than $4 a bushel. Why? Considering that a minor shift of $0.25 per bushel (US$10 per ton) translated to a $0.01 increase in the cost of a dozen eggs — this has had a colossal impact: a $700 million increase in production costs globally for turkeys alone. While price and availability of grains is the number one concern for feed producers, in surveys of farmers and feed manufacturers, mycotoxins and animal health are concerns Nos. 2 and 3. What solutions do we have? What new technologies must be adopted to survive in a dramatically changing world? Before we start, it is interesting to look at the world that we live in. We tend to think in terms of the populations in Europe, or in the US, but the reality is that most of the people in the world live in Southeast Asia. On the other hand, looking at where animal feed is manufactured provides a completely different picture. For example, The Netherlands produces 0.81 million tons of feed per million people, while India produces 0.01 million tons of feed per million people. Consider that India has a billion people. In other words where the people are is not where the feed is. We add to that a perspective on where meat is consumed in the world. meat in India is 10 kg of meat. China: the big ‘unknown,’ and now moving towards becoming the second largest global economy by 2020. There are 200 million people in China making more than $30,000 per year! China, with huge cities most westerners have never even heard of. Do you recognize the cities in this list? Most of us know Shanghai and Beijing, however there are 16 other cities all of which have more than five million people! For example, Ningbo is as big as Madrid and most of us have never heard of it! Any statistical move upward (or downward) in China is multiplied by its vast population (1.3 billion). 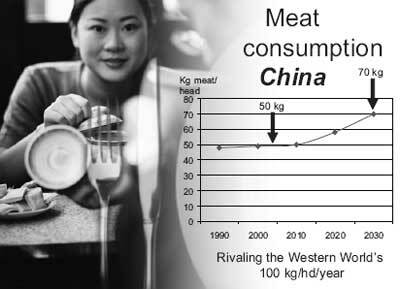 Should meat consumption grow to 70 kg — and it will — China would require an extra 600 million tons of feed, bringing global production to 1300 million tons. Where is all this feed grain going to come from? Even if Brazil, Argentina, the US, and the Ukraine could double production, we still could not feed China. 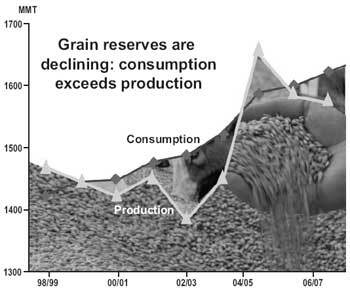 So we have a problem – we are consuming our grain reserves faster than they can be replaced. There is a widening gap between consumption and production of grains; and it is further compounded by the grain demanded for the biofuels program. A headlong rush into ethanol, both in Europe and in the US and indeed all around the world, is happening at a time when grain reserves are going down. The drive to biofuels is partly explained by a desire to be energy-independent and to eat into that 140 billion gallons of gasoline consumed annually in the US alone. It is also driven by the Kyoto Protocol, which mandates greenhouse gas reduction. A US target of 7.5 billion gallons of ethanol by 2012 has already led to 111 dry mill ethanol plants with a further 80+ being built that will consume 60 million tons of grain and produce 20 million tons of distillers dried grains (DDG). 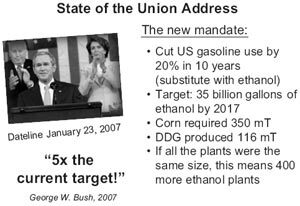 Increasing this target 5-fold means 400 more ethanol plants! Bipartisan support for the program has led to the single largest construction and investment program ever in US agriculture with over $70 billion poured into agriculture in 2006 alone. Iowa: the heart of the US ‘Corn Belt.’ Can you imagine Iowa, which now has dozens of distilleries and more coming, importing corn? That is exactly what is going to happen and, incidentally, it will mean that globally about 3 million more tons of DDG will be produced than soya (116 million tons DDG vs 113 million tons of soya). Where is all this grain going to come from? There are 2,000 million tons of grain scattered around the world, a quantity that while large, is finite. Can we increase production? The answer is yes, but at a cost. In fact, in 2007 there will be a shift away from soya acreage planted toward corn (some 3–4 million acres of soya) thus driving up the price of soya. it uses the same building block (glucose) for starch and cellulose, but starch is ‘edible’ by humans and monogastrics and cellulose is not. Cellulose in the fibrous parts of plants is the most abundant organic material in nature. It represents approximately 97–99% of cotton and 41–53% of wood and 30–43% of straw. It is resistant to hydrolysis. Why? Because the glucose is bound not by the α(1-4) glycosidic bond (as in easily-digested starch) but by a ß(1-4) linkage. In a way, it is the difference between eating starch-rich bread at a wooden table and eating the table. Cellulose cannot be broken down by the digestive enzymes found in humans and monogastric animals. Yet, the humble snail, Helix pornatia, produces a cellulase enzyme that completely hydrolyzes cellulose to glucose, as do various fungi and bacteria and even termites. What do we do? Are there any opportunities? 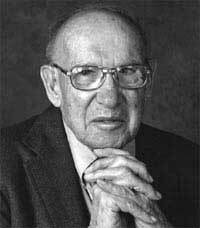 Of course there are; and we are reminded of comments from Peter Drucker, the late, great management guru: “You cannot predict the future, you have to create your own future.” That future is created by embracing new technologies. 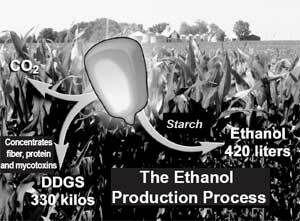 The technology that converts fiber in DDG or fiber in corn into energy, is called solid state fermentation (SSF). To witness solid state fermentation, take a loaf of bread and allow it to mold. Mold will grow on the surface and to survive it must break down fiber. Basically, in SSF systems we allow the microbe to convert fiber to energy and useful protein. In 1998 Alltech began creating its own future by building a commercial plant in Mexico to exploit this SSF system – the first such plant built in North America for over 50 years. Today, nearly seven years later, our MSc and PhD students have made some fascinating discoveries. SSF technology can be used to reduce the variability of DDG, the fat content of which can range from 2 to 10% and protein from 30 to 36%. They have used it to extract energy from DDG and from the fiber components in grain. The resulting product is simply called ‘SSF,’ and added to diets containing DDG, it releases an extra 200 kcal/kg, which at the time of writing is worth $15-16 per ton of feed. If instead the formulation is a typical corn-soy diet, about 70 kcal are released. In effect, the more fiber, the higher the savings. By growing the microbe on alternative fibrous raw materials such as palm kernel meal, cotton hulls, and rice bran, they too can be utilized to a much greater extent. It is but a single step, but a major one in switching our industry away from the ever increasing price-sensitive grains to nature’s abundance — cellulose. Will every feed mill have their own ‘termite mound,’ ie., an SSF plant? Probably not, but SSF is now Alltech’s fastest growing product, delivering cost savings and alternative raw materials at a critical time; and we are building another plant in Kentucky to keep up with demand. WHAT ABOUT MYCOTOXINS IN DDG? When it comes to mycotoxins, the future is also being created by young researchers. At the University of Guelph, MSc and PhD candidates are focusing on mycotoxins using the science of glycomics. This science has given us something that substantially reduces the negative impact of mycotoxins and created the patented product called Mycosorb®. PROTEIN SOURCES: WHAT ARE THE OPPORTUNITIES? As land acreage moves from soya to corn, clearly attention must be given to protein sources. Is there an opportunity? Is there another resource that can be diverted to protein production? Yes, it is sugar. The world has an abundance of sugar. In an open and free market, sugar is available. The global sugar market is approximately 130 million tons, and it is dominated by Brazil and India. Production could easily be increased and the world’s fish meal supplies – already under threat – could theoretically be replaced by 14 million tons of sugar. How? How do we get nitrogen into sugar? The Latin name for sugar is saccharose and the microorganism that utilizes it is called Saccharomyces – yeast. This microorganism, given adequate nitrogen, can convert 2 kg of sugar to 1 kg of protein from yeast. Thus 14 million tons could be used to replace 7 million tons of fish meal. However, rather than just producing protein to replace soya or fish meal, is it possible to generate, to create, a functional protein? Alltech’s yeast plant – already the world’s largest – in the state of Paraná in Brazil does just that – it varies the composition of the protein to suit the application. An example can be seen in infant milk formulas. What do all human infant formulas have in common? Even a brief examination of a label will answer that question: nucleotides, inositol, and glutamic acid. These functional ingredients are critical for palatability, for enzyme activation and in the case of nucleotides, to provide the nucleic acid building blocks for RNA for the rapidly growing baby. The product produced from sugar in the Alltech Paraná plant, NuPro®, is grown in such a way as to provide an inexpensive source of these key ingredients. The size of the plant, >50,000 tons, allows forwardthinking nutritionists to formulate a nucleotide source into neonatal and starter diets. Results to date have been impressive. When incorporated at 2– 3% of an early diet, or in some cases into the maternal diet, early growth and livability of progeny improved. In the case of piglets, weight gain increases were 640 g at the end of the nursery period, which ultimately resulted in market weight reached six days early with a savings in feed. The adage of ‘look after the baby and the adult will look after itself’ is certainly applicable! The key ingredient to this success is nucleotides – provided by NuPro®. Is there an application for NuPro® in ruminant diets, where balancing nitrogen availability and fermentable carbohydrate is critical? The answer is probably, although the rate of use has yet to be ascertained. In contrast, the rate of use has been determined for another protein source: nonprotein nitrogen (NPN) in a time-release form, called Optigen® II. By releasing nitrogen in a controlled step-by-step manner, microbial protein increases by ~5%. Nutritional models predict based on this improvement 1.5–2 kg more milk for the dairy animal or 1.5–2 kg more weight for the beef animal. In practice, this is what feeding 100 g of Optigen® II achieved. Just as importantly, less nitrogen is wasted and therefore the dairy farmer is in a better position to adhere to stricter rules regarding nitrogen waste. Today’s marketplace of changing raw material prices and availability, new and tighter regulations, open formulas, and total traceability requires a new set of tools for nutritionists and feed manufacturers. It also requires that we be flexible and capable of rapid change. Nowhere is this demonstrated as well as in the technology of the gene chip. Amazing yet true, it has been but a few years since the human genome was elucidated. However in the intervening years, the genomes of almost all food animals have been sequenced. A new science called ‘nutrigenomics’ has arisen. It is the science of the impact of nutrition on gene expression – literally feeding the gene. Our own company has embraced this technology and the Alltech Institute of Nutrigenomics, currently under construction, will be the first of its kind. Why all the excitement? Because it gives us greater control of nutrition than ever dreamed of: control at the gene level! The findings with Sel-Plex® – the only organic selenium allowed in Europe and the only source reviewed by the US FDA – represent but one excellent example of nutrigenomics at work. Selenium is an essential mineral with important roles in many bodily functions, from antioxidant defense to fertility. It has been typically fed as sodium selenite but, despite this, classic selenium deficiency symptoms continue to appear including mulberry heart disease, reproductive dysfunction, high mastitis incidence, and poor resistance to a wide variety of diseases. Nature provides selenium in a wide range of protein-forming and non-protein forming selenoamino acids, and humans and food animals consume these in plant or animal protein. For years both animal and human nutritionists have by-passed the role of the plant in the food chain by supplementing diets with sodium selenite, a by-product of copper mining. Alltech’s Sel-Plex® restores selenium to the food chain by using yeast, which like higher plants, are able to produce nutritionally useful organoselenium compounds. The result is a non-toxic, fully approved, organic selenium source. In controlled trials, the impact on animals has been remarkable when the switch to Sel-Plex® is made: increased productivity, more pigs per sow, more chicks per hen, better feed efficiency, less mastitis, increased milk production, improved immune status. The list is endless and illustrates the benefits of using natural nutrient forms. Why do these benefits occur? Can the gene help us understand what is happening? By monitoring expression patterns of genes known to be involved in carbohydrate or lipid metabolism or genes involved in reproductive function, a clear picture begins to emerge. Sel-Plex® is altering the expression of clusters of genes responsible for these very functions. For example, only one gene involved in lipid metabolism is influenced by sodium selenite, whereas 16 genes are altered by Sel-Plex®. Using this knowledge, nutritionists of the future will feed the genes responsible for specific functions. The world of feed production is facing a dilemma. That dilemma has been created by fuel ethanol production, which is consuming substantial amounts of feed grains. It is the major driving force towards alternative raw materials use and rising costs. When we compound this problem with increasing dietary mycotoxin levels – due in part to increased use of DDG – and other animal health concerns such as avian flu, new ideas and imagination are required. Albert Einstein once said that “imagination is more powerful than knowledge” while Milton Friedman emphasized that “freedom is a choice.” What imagination, then, can we bring to today’s problems, today’s opportunities, and what choices can we make? Let’s start with the cause of rising prices – the distillery itself. Distillery economics rely on markets for their by-products. As such, should not feed manufacturers – the end users of DDG – be in control? While we think of a distillery as producing alcohol, it actually produces alcohol, carbon dioxide, and DDG – one commodity converted into three commodities. Why not make value-added products, products that are suited to our needs as the customers? Do not call it a distillery, call it a biorefinery. If DDG are inconsistent, why not make them consistent? If monogastric animals cannot digest the fiber present in ingredients, why not pre-digest it? If lysine is limited, why not re-ferment DDG and thereby increase it? Why dry it if we can feed it wet? 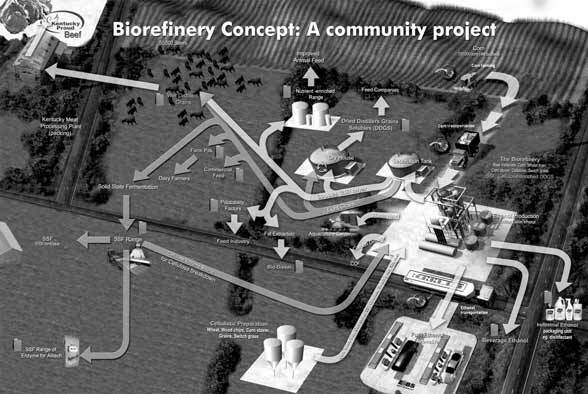 Alltech has designed its own pilot biorefinery. Perhaps it could be a model for future ventures. By today’s ethanol plant standards, this pilot plant is small – ~10 million gallons – but its features are far-reaching. The raw materials, on the order of 100,000 tons, will include fibrous sources such as wheat midds, corn stover and switchgrass, as well as grains. 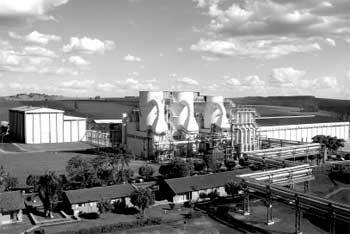 As such, it will be the first US plant to use cellulose as a significant percentage of its raw material. Its energy sources will be natural gas, but in due course methane will be generated (and burned) from the manure in the feedlot associated with the biorefinery. The plant will make three grades of ethanol: beverage, industrial and fuel grades, targeted at three identified local markets. The fuel alcohol will go into a national market, but some will be sold through an E85 (85% ethanol, 15% gasoline blend) filling station near the property. The collected carbon dioxide will be sold as such or used to extract oil for biodiesel use from the spent grains before drying. Surpluses can also be used to grow algae biomass, a valuable food for aquaculture. Apart from the numerous nutritional uses of DDG, re-circulating aquaculture systems can employ heat produced during fermentation. Other commercialized uses for DDG include feeding directly to cattle to be raised and marketed as locally produced beef under a locally branded label. Since the plant will incorporate cellulose as a raw material, a solid state fermentation system will be installed such that fungi can be used to produce a range of SSF products, one of which will be rich in cellulase and recycled to the biorefinery. Enhancement with other key nutrients is also possible. The goal is to create a viable plant with as many value-added streams as possible using a flexible, integrated system capable of adopting emerging technologies. Overall, this biorefinery will represent feed, food and energy production coming together. Local farmers will create local jobs using local raw materials, and at the same time build an opportunity for branding. To create our futures we must use new technologies; and we must adopt them rapidly, ahead of the competition. Corn has gone from $2/bushel (~$80 a ton) to $4/bushel (~$160/ton) and will continue to increase. We must break out of the corn/soya mentality. • SSF: Enabling use of the fiber in grains, and enabling more extensive utilization of DDG. It controls costs and increases flexibility in raw material selection. • Fermentation and yeast technology: a new nucleotide-rich protein called NuPro®, which heretofore went only to human infants, now can go to animal infants – reducing days to market and saving feed. • Nutrigenomics: The gene chip tells us how animals respond to ingredients at the gene level. We are not just feeding the animal, we are feeding the genes that improve productivity. • Sel-Plex® organic selenium: Sel-Plex® selenium is in the form nature intended for the food chain. Improved health and productivity more than justify its use; and confidence is further extended by its exclusive approval by the EU and review by the FDA. • Glycomics: Use of patented glucan molecules derived from the science of glycomics – Mycosorb® – means we no longer need to fear mycotoxins. • Yeast technology: The use of sugars derived from yeast cell wall (Bio-Mos®) has provided not just a viable alternative to antibiotic growth promoters but an improvement. • Bioplex® organic trace minerals: Biochemistry explains how pollution can be drastically reduced by bioplexing trace minerals. We can reduce inclusion rates of copper and zinc and still improve mineral retention in the animal. Let’s see the grain crisis as an opportunity and a chance to elevate our performance and reduce our costs. Let’s see it as a challenge – a challenge to get out of a rut and create a new feed industry that is totally involved in a customer-friendly and traceable food chain. Let’s grasp these opportunities and create our own futures by embracing technology, and go for it! Today, we have a choice: Let’s take action! Animal agriculture has undergone remarkable change and growth during the past few decades, and it will continue to change in the coming years to meet higher demand for low-cost, healthy and convenient products. In addition to the expanding markets, animals are being genetically selected for ever increasing growth performance and efficiency. What will the future bring for feed manufacturers? Any attempt to predict the future should be based on sound assumptions and counting the variables into the projection to get a feeling where we are heading and what the drivers are that may determine the factors of what lies ahead of us. This paper follows the style of other researchers and will show 10 major drivers which may be shaping the future each in their own way.